This article is about the animal. For the American broadcast television network, see Fox Broadcasting Company. For other uses, see Fox (disambiguation). 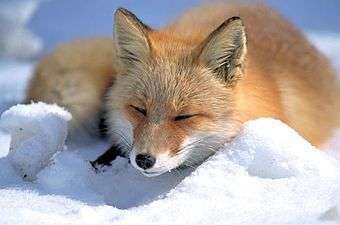 The word fox comes from Old English, which derived from Proto-Germanic *fuhsaz. [nb 1] This in turn derives from Proto-Indo-European *puḱ-, meaning ’thick-haired; tail’. [nb 2] Male foxes are known as dogs, tods or reynards, females as vixens, and young as cubs, pups, or kits, though the latter name is not to be confused with a distinct species called kit foxes. A group of foxes is referred to as a skulk, leash, or earth. Foxes are generally smaller than other members of the family Canidae such as wolves, jackals, and domestic dogs. For example, in the largest species, the red fox, males weigh on average between 4.1 and 8.7 kg (9.0 and 19.2 lb), while the smallest species, the fennec fox, weighs just 0.7 to 1.6 kg (1.5 to 3.5 lb). 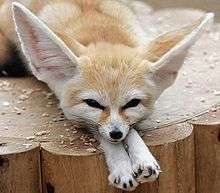 Fox-like features typically include a triangular face, pointed ears, an elongated rostrum, and a bushy tail. Foxes are digitigrade, and thus, walk on their toes. Unlike their dog relatives, foxes have partially retractable claws. Fox vibrissae, or whiskers, are black. The whiskers on the muzzle, mystaciae vibrissae, average 100-110mm long, while the whiskers everywhere else on the head average to be shorter in length. Whiskers (carpal vibrissae) are also found on the forelimbs and average to be 40mm long, pointing downward and backward. Other physical characteristics vary according to habitat and its adaptive significance. 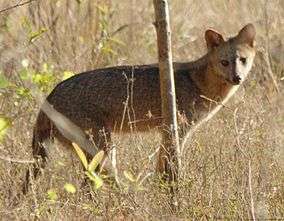 The gray fox is one of only two canine species known to climb trees; the other is the raccoon dog. The male fox's scrotum is held close to the body with the testes inside even after they descend. Like other canines, the male fox has a baculum, or penile bone. The testes of red foxes are smaller than those of Arctic foxes. Sperm formation in red foxes begins in August–September, with the testicles attaining their greatest weight in December–February. Whine - Made shortly after birth. Occurs at a high rate when kits are hungry and when their body temperatures are low. Whining stimulates the mother to care for her young; it also has been known to stimulate the male fox into caring for his mate and kits. Yelp - Made about 19 days later. The kits' whining turns into infantile barks, yelps, which occur heavily during play. Explosive call - At the age of about one month, the kits can emit an explosive call which is intended to be threatening to intruders or other cubs; a high pitch howl. Growl - An adult fox's indication to their kits to feed or head to the adult's location. Foxes are often considered pests or nuisance creatures for their opportunistic attacks on poultry and other small livestock. Fox attacks on humans are not common. Many foxes adapt well to human environments, with several species classified as "resident urban carnivores" for their ability to sustain populations entirely within urban boundaries. Foxes in urban areas can live longer and can have smaller litter sizes than foxes in non-urban areas. Urban foxes are ubiquitous in Europe, where they show altered behaviors compared to non-urban foxes, including increased population density, smaller territory, and pack foraging. Foxes have been introduced in numerous locations, with varying effects on indigenous flora and fauna. Fox hunting originated in the United Kingdom in the 16th century. Hunting with dogs is now banned in the United Kingdom, though hunting without dogs is still permitted. Red foxes were introduced into Australia in the early 19th century for sport, and have since become widespread through much of the country. They've caused population decline among many native species and prey on livestock, especially new lambs. Fox hunting is practiced as recreation in several other countries including Canada, France, Ireland, Italy, Russia and the United States. There are many records of domesticated red foxes and others, but rarely of sustained domestication. A recent and notable case is the Russian silver fox, which resulted in visible and behavioral changes, and is a case study of an animal population modeling according to human domestication needs. The current group of domesticated silver foxes are the result of nearly fifty years of experiments in the Soviet Union and Russia to domesticate the silver morph of the red fox. This selective breeding resulted in physical and behavioral traits appearing that are frequently seen in domestic cats, dogs, and other animals, such as pigmentation changes, floppy ears, and curly tails. Notably, the new foxes became more tame, allowing themselves to be petted, whimpering to get attention and sniffing and licking their caretakers. 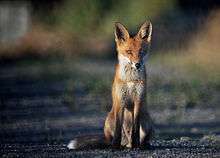 Foxes, particularly red foxes, have been inhabiting and breeding in human-populated areas since the twentieth century. They have adapted well to these environments, taking advantage of man-made features such as houses and gardens to create dens. For sustenance, they take advantage of food thrown away by humans. In some cases, human residents will feed foxes that frequent their local area. In this sense, a benign relationship has been established in which foxes have become comfortable and amiable toward the humans who, while becoming their providers, do not much mind the presence of the foxes. However, for some, urban foxes have proven to be a nuisance due to their intrusion and destruction of private property. Urban fox control methods and laws vary regionally. In Asian folklore, foxes are depicted as a familiar spirit possessed of magic powers. Similar to Western folklore, foxes are depicted as mischievous, usually tricking other people, with the ability to disguise as an attractive female human. However, there are other depictions of foxes as a mystical, sacred creature, that can either bring wonder or ruin. Nine-tailed foxes appear in Chinese folklore, literature, and mythology, in which, depending on the tale can be a good or a bad omen. The motif was eventually introduced from Chinese to Japanese and Korean cultures. ↑ Cf. West Frisian foks, Dutch vos, and German Fuchs. ↑ Cf. Hindi pū̃ch ‘tail’, Tocharian B päkā ‘tail; chowrie’, and Lithuanian paustìs ‘fur’. The bushy tail also forms the basis for the fox's Welsh name, llwynog, literally meaning ‘bushy’, from llwyn meaning ‘bush’. Likewise, Portuguese: raposa from rabo ‘tail’, Lithuanian uodẽgis from uodegà ‘tail’, and Ojibwa waagosh from waa, which refers to the up and down "bounce" or flickering of an animal or its tail. ↑ Macdonald, David W.; Sillero-Zubiri, Claudio, eds. (2004). 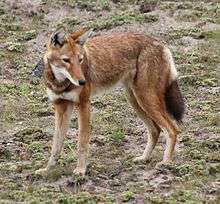 The biology and conservation of wild canids (Nachdr. d. Ausg. 2004. ed.). Oxford: Oxford University Press. p. 49. ISBN 0198515561. 1 2 3 4 5 6 7 8 9 10 11 12 Lloyd, H.G. (1981). The red fox (2. impr. ed.). London: Batsford. p. 21. ISBN 0-7134-11902. ↑ Fellows, Dave. "Animal Congregations, or What Do You Call a Group of.....?". Northern Prairie Wildlife Research Center. USGS. Retrieved 9 October 2014. 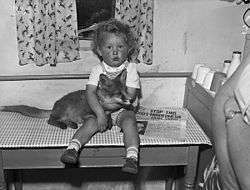 ↑ "Fox Cubs and the breeding cycle". New Forest Explorers Guide. Retrieved 29 July 2016. ↑ Larivière, S.; Pasitschniak-Arts, M. (1996). 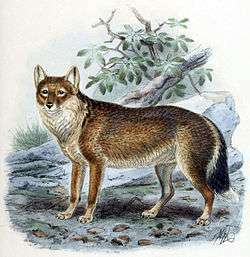 "Vulpes vulpes". Mammalian Species: No. 537, pp. 1–11. doi:10.2307/3504236. ↑ Nobleman, Marc Tyler (2007). Foxes. Benchmark Books (NY). pp. 35–36. ISBN 978-0-7614-2237-2. 1 2 3 4 5 Burrows, Roger (1968). Wild fox. Newton Abbot: David & Charles. ISBN 9780715342176. ↑ "Arctic fox (Vulpes lagopus)". ARKive. Retrieved 2 October 2014. ↑ Fox, David. "Vulpes vulpes, red fox". Animal Diversity Web. Retrieved 2 October 2014. ↑ "Canidae". The University of Edinburgh. Retrieved 23 September 2014. ↑ Fedriani, J.M. ; T. K. Fuller; R. M. Sauvajot; E. C. York (2000-07-05). "Competition and intraguild predation among three sympatric carnivores" (PDF). Oecologia. 125 (2): 258–270. doi:10.1007/s004420000448. PMID 24595837. ↑ Fox, David L. (2007). "Vulpes vulpes (red fox)". Animal Diversity Web. University of Michigan Museum of Zoology. ↑ Macdonald, David W. (26 April 2010). "Food Caching by Red Foxes and Some Other Carnivores". Zeitschrift für Tierpsychologie. 42 (2): 170–185. doi:10.1111/j.1439-0310.1976.tb00963.x. ↑ Čanády, Alexander. "Variability of the baculum in the red fox (Vulpes vulpes) from Slovakia." Zoology and Ecology 23.3 (2013): 165-170. ↑ Bijlsma, Rob G. "Copulatory lock of wild red fox (Vulpes vulpes) in broad daylight." Naturalist 80: 45-67. ↑ Parkes, I. W. Rowlands and A. S. (21 August 2009). "The Reproductive Processes of certain Mammals.-VIII. Reproduction in Foxes (Vulpes spp.).". Proceedings of the Zoological Society of London. 105 (4): 823–841. doi:10.1111/j.1469-7998.1935.tb06267.x. ↑ Hildebrand, Milton (1952). "The Integument in Canidae". Journal of Mammalogy. 33 (4): 419–428. doi:10.2307/1376014. JSTOR 1376014. ↑ Tembrock, Günter. "Canid vocalizations". Behavioural Processes. 1 (1): 57–75. doi:10.1016/0376-6357(76)90007-3. ↑ Ginsburg, Joshua Ross and David Whyte MacDonald. Foxes, Wolves, Jackals, and Dogs. p.58. ↑ Bathgate, Michael. The Fox's Craft in Japanese Religion and Culture. 2004. p.18. 1 2 ANGULO, ELENA; ROEMER, GARY W.; BEREC, LUDĚK; GASCOIGNE, JOANNA; COURCHAMP, FRANCK (29 May 2007). 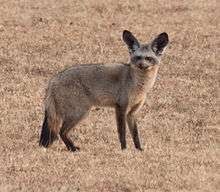 "Double Allee Effects and Extinction in the Island Fox". Conservation Biology. 21 (4): 1082–1091. doi:10.1111/j.1523-1739.2007.00721.x. 1 2 Primack, Richard B. (2014). Essentials of conservation biology (Sixth ed.). Sinauer Associates. pp. 143–146. ISBN 9781605352893. 1 2 3 Kohlmann, Stephan G.; Schmidt, Gregory A.; Garcelon, David K. (10 April 2005). "A population viability analysis for the Island Fox on Santa Catalina Island, California". Ecological Modelling. 183 (1): 77–94. doi:10.1016/j.ecolmodel.2004.07.022. 1 2 "Channel Islands: The Restoration of the Island Fox". National Park Service. Retrieved 25 September 2014. 1 2 3 4 5 Jiménez, J. E. (2006). "Ecology of a coastal population of the critically endangered Darwin's fox (Pseudalopex fulvipes) on Chiloé Island, southern Chile". Journal of Zoology. 271 (1): 63–77. doi:10.1111/j.1469-7998.2006.00218.x. Retrieved 30 September 2014. ↑ Jiménez, J.E. ; Lucherini, M. & Novaro, A.J. (2008). "Pseudalopex fulvipes". IUCN Red List of Threatened Species. Version 2014.1. International Union for Conservation of Nature. Retrieved 30 September 2014. 1 2 3 4 Yahnke, Christopher J.; Johnson, Warren E.; Geffen, Eli; Smith, Deborah; Hertel, Fritz; Roy, Michael S.; Bonacic, Cristian F.; Fuller, Todd K.; Van Valkenburgh, Blaire; Wayne, Robert K. (1996). "Darwin's Fox: A Distinct Endangered Species in a Vanishing Habitat". Conservation Biology. 10 (2): 366–375. doi:10.1046/j.1523-1739.1996.10020366.x. ↑ Barratt, Sarah and Martin Barratt. Practical Quail-keeping. 2013. 1 2 Iossa, G. et al. A Taxonomic Analysis of Urban Carnivore Ecology, from Urban Carnivores. Stanley Gehrt et al. eds. 2010. p.174. ↑ Francis, Robert and Michael Chadwick. Urban Ecosystems 2013. p.126. ↑ See generally Long, John. Introduced Mammals of the World. 2013. ↑ "Hunt campaigners lose legal bid". BBC News Online. 2006-06-23. ↑ Singh, Anita (2009-09-18). "David Cameron 'to vote against fox hunting ban'". The Daily Telegraph. London. Archived from the original on 30 September 2009. Retrieved 2010-05-02. ↑ "Fox Hunting: For and Against" (PDF). ↑ "The most affectionate foxes are bred in Novosibirsk - citation needed -". Redhotrussia.com. Retrieved 2014-04-08. ↑ Trut, Lyudmila N. (1999). "Early Canid Domestication: The Fox Farm Experiment" (PDF). American Scientist. 87. ↑ Harris, Stephen (1986). Urban Foxes. 18 Anley Road, London W14 OBY: Whittet Books Ltd. ISBN 0905483472. ↑ Uther, Hans-Jörg (2006). "The Fox in World Literature: Reflections on a "Fictional Animal"". Asian Folklore Studies. 65 (2): 133–160. JSTOR 30030396. ↑ Kang, Xiaofei (2006). The cult of the fox: Power, gender, and popular religion in late imperial and modern China. New York: Columbia University Press. p. 15–21. ISBN 0-231-13338-3. ↑ Wallen, Martin (2006). Fox. London: Reaktion Books. pp. 69–70. ISBN 9781861892973. ↑ "Constellation Names". Constellation Guide. Retrieved 1 October 2014. ↑ Sprott, Julien. Elegant Chaos 2010. p.89. ↑ Komarova, Natalia. Axiomatic Modeling in Life Sciences, from Mathematics and Life Sciences. Alexandra Antoniouk and Roderick Melnik, eds. pp.113–114. "Fox". The American Cyclopædia. 1879. "Fox". Encyclopædia Britannica. 9 (9th ed.). 1879. "Fox". New International Encyclopedia. 1905. "Fox". Encyclopædia Britannica (11th ed.). 1911. "Fox". The New Student's Reference Work. 1914. "Fox". Collier's New Encyclopedia. 1921.